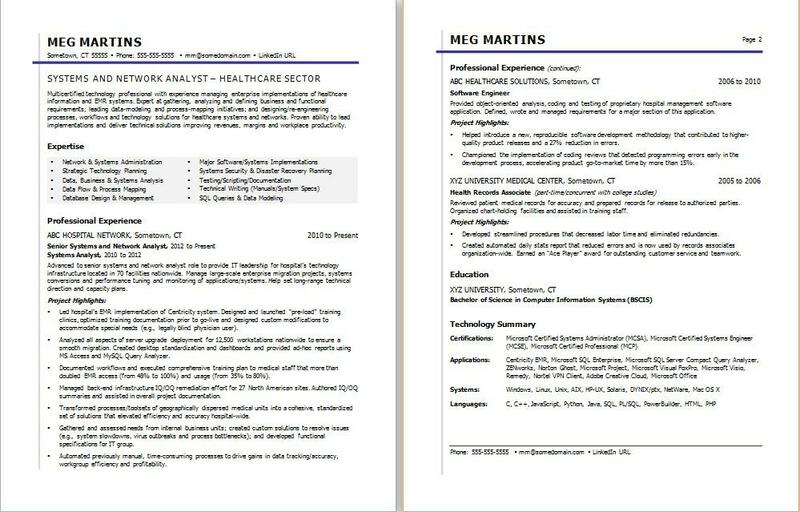 To develop a powerful resume for a career in healthcare technology as a software engineer, view the sample resume below, and download the healthcare IT professional resume template in Word. And if you need more help, let the experts at Monster's Resume Writing Service create a high-impact resume for you that will impress employers. Jobs for healthcare IT professionals are projected to grow by 13% (or 27,800 jobs) from 2016 through 2026, which is faster than average, according to the Bureau of Labor Statistics (BLS). You'll find the highest level of employment for this job in the following states: California, Texas, Florida, New York, and Ohio; and in the following metropolitan areas: Los Angeles, New York City, Chicago, Phoenix, and Houston. As a healthcare IT professional, you can expect to earn a median wage of $39,180 per year, or $18.83 per hour, according to the BLS. Additionally, you can learn more about healthcare careers and search for healthcare IT jobs on Monster. Multicertified technology professional with experience managing enterprise implementations of healthcare information and EMR systems. Expert at gathering, analyzing and defining business and functional requirements; leading data-modeling and process-mapping initiatives; and designing/re-engineering processes, workflows and technology solutions for healthcare systems and networks. Proven ability to lead implementations and deliver technical solutions improving revenues, margins and workplace productivity. Advanced to senior systems and network analyst role to provide IT leadership for hospital’s technology infrastructure located in 70 facilities nationwide. Manage large-scale enterprise migration projects, systems conversions and performance tuning and monitoring of applications/systems. Help set long-range technical direction and capacity plans. Led hospital’s EMR implementation of Centricity system. Designed and launched “pre-load” training clinics, optimized training documentation prior to go-live and designed custom modifications to accommodate special needs (e.g., legally blind physician user). Analyzed all aspects of server upgrade deployment for 12,500 workstations nationwide to ensure a smooth migration. Created desktop standardization and dashboards and provided ad-hoc reports using MS Access and MySQL Query Analyzer. Documented workflows and executed comprehensive training plan to medical staff that more than doubled EMR access (from 48% to 100%) and usage (from 35% to 80%). Managed back-end infrastructure IQ/OQ remediation effort for 27 North American sites. Authored IQ/OQ summaries and assisted in overall project documentation. Transformed processes/toolsets of geographically dispersed medical units into a cohesive, standardized set of solutions that elevated efficiency and accuracy hospital-wide. Gathered and assessed needs from internal business units; created custom solutions to resolve issues (e.g., system slowdowns, virus outbreaks and process bottlenecks); and developed functional specifications for IT group. Automated previously manual, time-consuming processes to drive gains in data tracking/accuracy, workgroup efficiency and profitability. Provided object-oriented analysis, coding and testing of proprietary hospital management software application. Defined, wrote and managed requirements for a major section of this application. Helped introduce a new, reproducible software development methodology that contributed to higher-quality product releases and a 27% reduction in errors. Championed the implementation of coding reviews that detected programming errors early in the development process, accelerating product go-to-market time by more than 15%. Reviewed patient medical records for accuracy and prepared records for release to authorized parties. Organized chart-holding facilities and assisted in training staff. Developed streamlined procedures that decreased labor time and eliminated redundancies. Created automated daily stats report that reduced errors and is now used by records associates organization-wide. Earned an “Ace Player” award for outstanding customer service and teamwork.